I moved off Paul’s boat on Monday and slept on Ernie’s boat this week. Tonight I shall be moved in into Ernie’s apartment in Amstelveen. There has been progress on the boat project. I put the first full coat of epoxy on the deck and expect to have the fiber glass mat on today. Then a couple more coats epoxy, primer and paint. The weather has been cool and after not having had a Spring we now have an early Fall. But for the boat work I am not complaining, ideal epoxy weather because the higher temperatures make the wonder stuff kick off too fast. In Holland Paul de Leeuw is a well known tv personality. But I like my Dutch-Canadian-Kiwi Paul de Leeuw better. Paul came to visit me yesterday. We have been close friends since 1975. 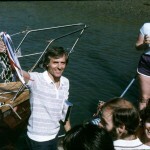 Before Paul moved to New Zealand in 1986 we saw each other regularly in Vancouver, he crewed on “Gemini” and “Fleetwood” in most of my Swiftsure sail races. We both had our own wood export companies. 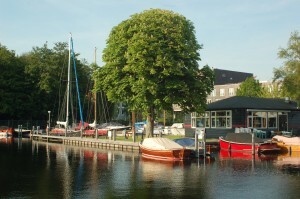 He is vacationing in Waddinxveen. 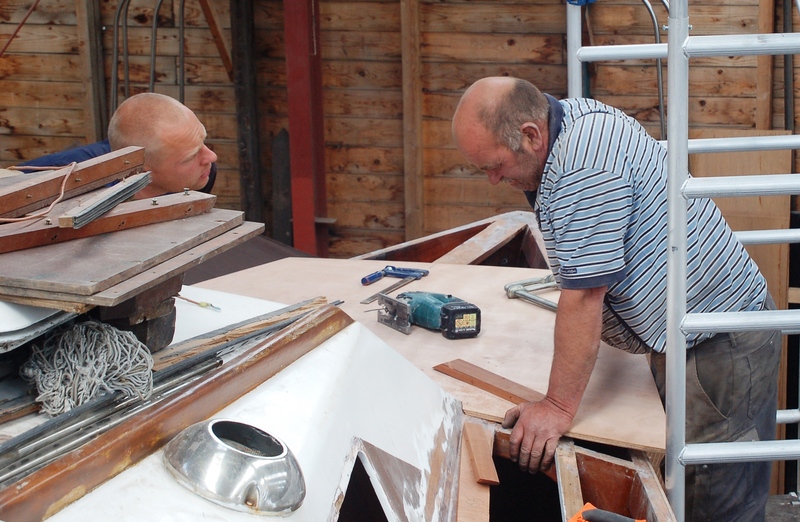 Paul walked in when father/son de Boer were laying another deck section on the boat. We walked back to the marina and talked till nearly midnight. Saturday June 15. 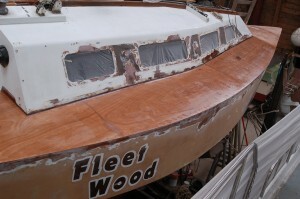 Progress on “Fleetwood” and rescued from homelessness. Today was the big day. The first deck panels are installed. 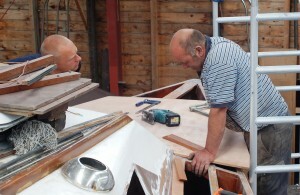 Hans de Boer, the yard manager, and his son Bas cut, beveled and scarfed the 1/2″ Gaboon (Okoume) marine plywood panels. They used stainless steel staples and just a few screws. I am quite pleased with the result so far. I finished the priming and two coats of white paint in the cabin interior. You’ll just have to come and take a look for your selves. There will still be a lot of work epoxy puttying the joints and fastener spots. Then several coats of epoxy, next the fiberglass cloth and white deck paint. Then the refinishing of the hull, house and cockpit exterior. I estimate that I should be back in the water in mid July. Then comes at least two weeks of re-installing all the deck hardware and putting the interior back together. And finally the mast repairs and stepping of the mast. Ernie de Boer, a friend of the Schinkel Y.C., will let me stay at his flat in Amstelveen. I expect to move my few things off Paul’s boat on Sunday. Today I put on the first clear finish coat of the hull interior and the primer coat for the cabin sides and roof. The deck is just about ready for the new deck. It was an enormous time consuming job to fair the cabin sides and the deck frame support. Over the 33 years life of “Fleetwood” the teak deck had been sanded and newly caulked at least 15 times. I used black “5200” to caulk and it is impossible to remove with a mechanical sander. I have carried 4 quarts of clear 1 part epoxy finish from “Top Secret Coatings” aboard since the spring of 2008. It sounded like a better alternative to finish my clear hull, rather than two part linear polyurethane I had used until then. But it did not like the Florida heat, it looked like a bubble bath. The next year I painted the hull exterior. But it works dandy for the clear finished interior. See below picture. So now my living room walls will again resemble a Stradivarius. This is the first time in 33 years that the hull interior is redone. 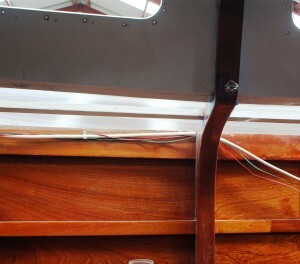 The clear Mahogany plywood panels came from the Whisstock’s boat yard already coated with West System epoxy. What I found odd is that some of the panels still had a very sound epoxy base while others the epoxy was loose and could be easily scraped off. And it did not seem to matter if they were in dark spots where little light could break the epoxy down or in exposed areas. I am glad I had the chance to get at the nooks and crannies with the deck off. She will be like brand new again. I could not save the teak cockpit coamings, 1 1/4 x 8″ x 6’6″ (30 x 200mm x 1,95m) to replace these I was quoted € 239 ($ 325) in rough lumber, milled, I am looking at probably close to $500. The teak rub-rails are more expensive yet. I think I’ll look for an alternate specie. I am going to get help from the yard where I am working to cut the plywood to the patterns I have saved and to scarf the joints and bevel the edges where it joints the sloping cabin sides. The summer is here now and I am trying to get an early start and then take a long siesta when the heat in the shed gets unbearable. I am still looking for a home before I have to vacate the spot here in the marina the end of this week. June 6th. From winter directly into Summer. Summer arrived on June 4th. The day before the mercury still dropped to zero centigrade in places here. I washed my winter clothes and have been in shorts the last two days. The morning and evenings are in the mid fifties but midday it gets up to between the mid sixties and mid seventies. 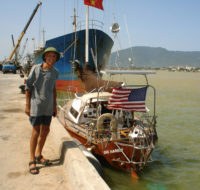 This means that I have to do my epoxy work on “Fleetwood” in the early morning. The temperature under the roof of the shed I am in gets at least 15 degrees higher. 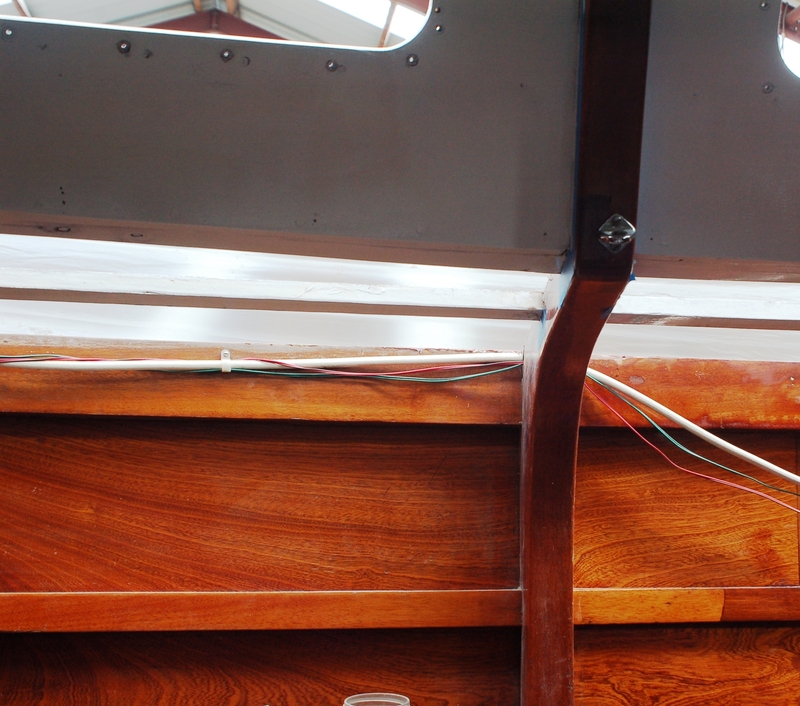 I have sanded the interior (clear mahogany) hull and the (white painted) coach roof and cabin sides. This is the first time that I have had the opportunity to refinish the interior. 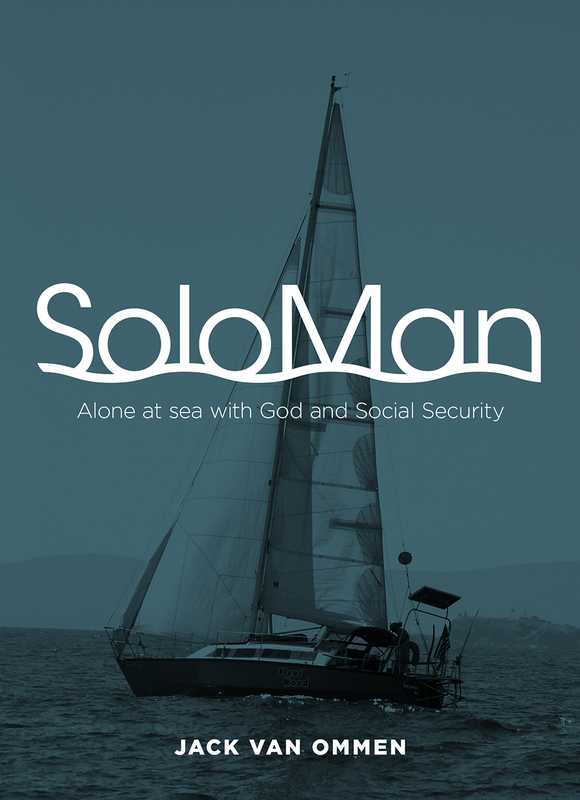 It is nearly impossible to do when your boat is also your home. I filled in the damage from the removal of the deck and the the nail and screw holes and am now nearly done sanding it. I should be having the new deck installed within the next ten days . Then the exterior works start. I’ll have to repaint the house and the cockpit, the hull and the anti fouling. With a little luck I should be floating again by late July. Then I have to get the mast in Lelystad and do some work on it. 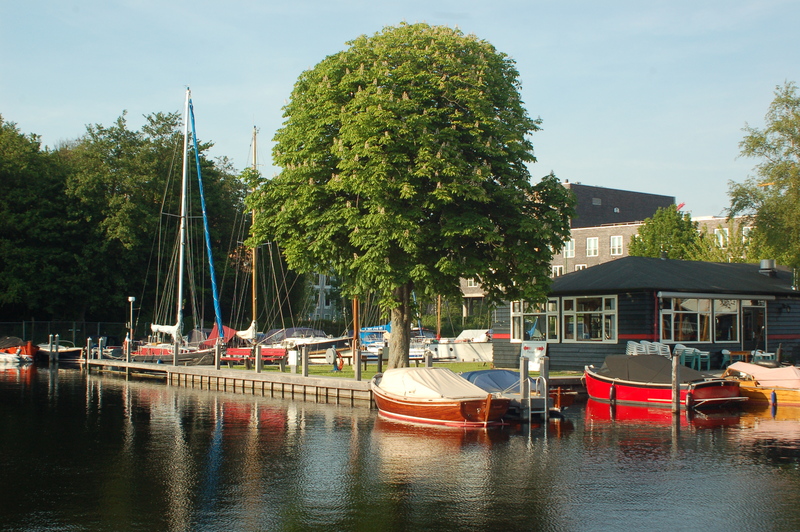 I will lose my spot on Paul’s boat here in “De Schinkel” marina in the next ten days. He is getting ready to fix the boat up for sale. So, I am looking again for a place to sleep and, if possible, cook my meals. Preferably near where I work on the boat in Buitenveldert. Als U op vakantie gaat pas ik op Uw huis of boot en ongedierte. 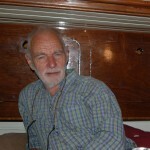 Yesterday, Evert Slijper, stopped by and we went to lunch on the “Veranda”, near here. I met Evert in 1972 in Eugene, Oregon where he still lives. (People often wonder why/how I try to remember dates. I use my divorce dates and the years of my cars, 1972 was my first divorce…) Coincidence has it that Evert happens to know many of the club members here at “de Schinkel” he frequently sailed in their “Freedom” class sail boat races. 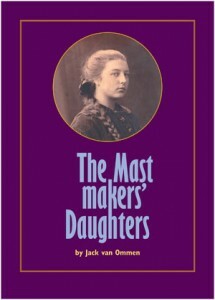 He is visiting his mother in Haarlem this week. He also sails “Thistles” and we have mutual “Thistle” friends in Gig Harbor and Tacoma, as well. So, we had a great time catching up sitting outside on the edge of the “Amsterdamse Bos”. "de Schinkel" from the side where I work on my boat. My, soon to end, water view home is the tallest masted boat.